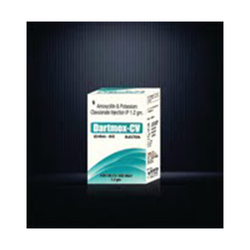 Our range of products include dartmox cv 1.2gm injection, dartmox-cv injection and eous tz tazobactam injection. Backed by our rich exposure in this domain, we are dedicatedly affianced in presenting the wide array of Dartmox CV 1.2Gm Injection to our valuable clients. These products contain pantoprazole sodium sesquihydrate IP 40mg and excipients q.s. Furthermore, these are well known for their superior quality and longer shelf life. In addition to this, this is offered at very reasonable rates. 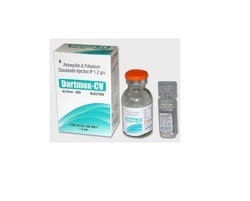 We are offering to our clients a wide assortment of Dartmox-CV Injection. Our provided range of this product is the composition of piperacillin 4gm and tazobactam 0.5gm injection. These products are highly recommended for non-toxicity, long shelf life, and optimum results. In addition to this, this is offered at very reasonable rates. 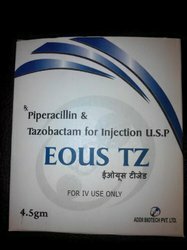 we are involved in offering EOUS TZ Tazobactam Injection. This product is admired for its high quality, right composition, and various packaging. These products are widely used for its effective results. In addition to this, these are checked by our quality inspectors to deliver only pure and effective range at clients end. Looking for Pharmaceutical Injection ?